� Abstract. In the present conditions of the market economy in Romania the most important problem for the economic agents is to change their employ work mentality and to educate them in the spirit of marketing attitude. So, companies can not only survive in the transition market economy but they become efficient and they can easy adept whole activity in this context. The paper presents a real case of development at RECON Company in Brasov, who develop first an investment program and then a human resources development program, the last one, financial supported by the PHARE Progres an UE program in Romania. The experience that was accumulated by this company is a positive one and have to be disseminate. � Abstract. Starting to the electro-hydrodynamic analogy for the electric and hydraulic conductors, on tackles the forced flowing of the izodenses fluids in the stationary regime, from an energetically point of view, obtaining relevant expressions and indicators. On particularise for effluent flow, the transport of the energy carrying fluids by forced flow conduits and for parallel connected conduits. The energetically optimisation, sustained by this analytical study is relevant for adequate measures in the design, construction and exploitation stages, eventually by measures for a further modernisation and a flow regime adjustment, exemplifying by two concrete numerical applications. 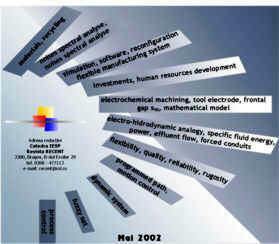 � Keywords: electro-hidrodynamic analogy, specific fluid energy, power, effluent flow, forced conduits. � Abstract. The paper presents the structure of original simulation software for discrete production in machines manufacturing. This software was made for being used by students in a simulated enterprise, for performing in their education. � Abstract. The paper presents the functions of mechanical presses coupling, technical and economic considerations for establishing their torque moment, the equations used for calculus, and the steps of establishing geometrical and functional parameters that describe these couplings, conceived as module-subassembly. � Abstract. The most precisely experimental research of the machine tools acoustic field can be realising by using the spectral analyses. The parameter that we are interested for the measurement is the acoustic pressure level L [dB(A)] for each selected frequency from a 1/1 filter set, in the field 31.5 � 31.500 Hz (11 frequency domains). This is the context of the paper. For the pressing machine PMCP100 we have made a calculation example using the methodology of the spectral analyze. Finely, some eloquent conclusions have been elaborated using the results from an acoustic field research that was done for four pressing machines (one of them was a made in Czech Republic). � Abstract. In the framework of this approach, the programmed path and control are constructed so that the reaction forces acting on the end effector could not exceed the critical boundaries. The program control will guide the object along the synthesised path in the presence of mentioned constraints and disturbances. � Abstract. This paper approaches the matter of the PC Controlling Management System for Complex surface processing through ECM, by creating a mathematical model; in this way we are trying to solve at least three major problems specific to this machining process. � Abstract. The quality of the processed component surface became a more and more important criterion that provides a good reliability of the product along with its maintaining on the concurential market. A good operating of the product as well as the safety in maintaining technical and economical parameters depend on the extent of providing the surface quality according to the execution specification. The paper presents two constructive solutions for a device to superfinish external cylindrical surfaces of the main shaft in the truck gearbox. � R�sum� �tendu. La plupart des produits aujourd�hui sont constitu�s de nombreuses mati�res diff�rentes, totalement incompatibles les unes avec les autres: m�taux, plastiques, textiles etc. La revalorisation des plastiques passe par des solutions vari�es, en fonction de la valeur du mat�riau, de l�homog�n�it� et de la constance de la composition du d�chet et du co�t de la fili�re collecte/recyclage (d�pendant notamment de la diss�mination des gisements et du devenir des produits recycl�s): le r�emploi, le recyclage m�canique, le recyclage thermique, le recyclage chimique. Une des voies int�ressantes de revalorisation des produits manufactur�s en fin de vie est le recyclage m�canique. Il consiste en une r�duction dimensionnelle des produits suivie d�une refusion directe, et d�un remoulage comme nouvelle mati�re, �ventuellement apr�s addition de produit virge et/o� d�additifs permettant de restaurer (en partie) les propri�t�s initiales. � Abstract. Using the optimization method of Fuzzy Associative Memories (FAMs) proposed in the paper exemplifies the case of three criteria multiple attribute decision making. The literature indicates the use of a scale of the criteria relative importance with constant step and different shrewdness degrees. In the paper is adopted a simplified scale in which the greater step determine different weight coefficient for ordinate variants, lay on a greater field. The weight coefficient associated to the criteria ratio covers partially the complete scale value. Minimizing the number of rules for FAMs used in multiple attributes decisions is a general criterion for optimizing a set of fuzzy rules. A possible direction of increasing the hierarchy precision is the use of rules matrices in which the recurrence degree of linguistic values of output variables will be minimum. � Abstract. The paper presents some new requirements and trends concerning practical problems for the automotive sensors. Automotive sensors are far higher in numbers than other kinds. Therefore, this paper deals with some practical improvements in this direction. The requirements for automotive sensors are not easily satisfied, but step by step the aim is to establish more reliable and rational control system. � Abstract. The work presents points of view regarding the necessity of passing to the flexible organisation and leadership of the technological systems, the only ones able to assure their best running in the conditions of an economic medium in permanent change.